As the day draws closer to the North American release of Cretaceous Vol. 1 previews and interviews have started to amass. Lady Luck smiles upon the tyrant ones and friends as the reviews have been nothing, but amazing. Nothing , but positive vibes for Cretaceous. Not to be one who dwells on the validation from others, but I’d be lying through my teeth if damn it didn’t feel good. One of the best parts of any interview or showcase is the previews, which means I can show more pages here on the ol’ digital word dump. AV Club was the first to throw down the gauntlet with their review and exclusive preview. Later, one of my favorite pop-culture outlets SYFY Wire kept the momentum up with an interview, where I really got to discuss some of the production process with writer Jeff Spry. They also included their own exclusive preview of some the pages from the book. Over at Trainwreck’d Society I sat down with Ron Trembath and we got into it during the holidays. Everything from Cap Wolf to the Blue Tiger podcast. It’s worth the time if you want to read of my humble beginnings to current … existence. Also Cretaceous was featured along with other things on the horizon. 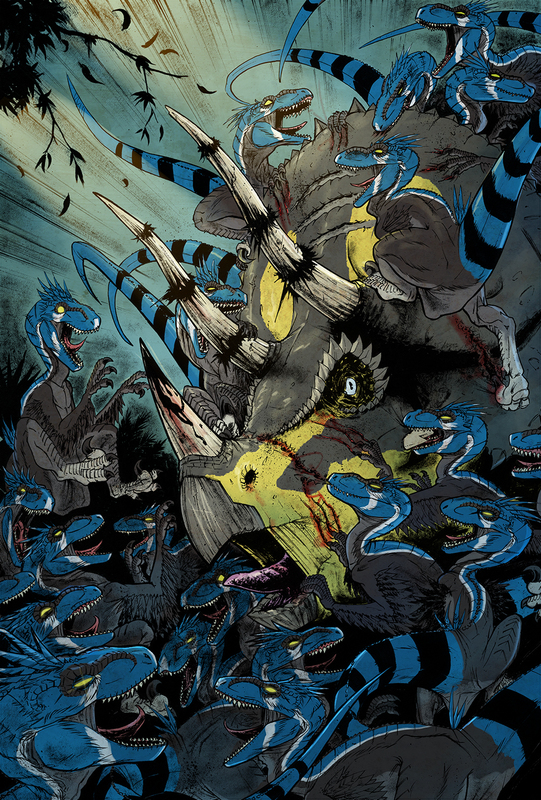 And if you’re interested in Cretaceous, it’s still available for pre-order. Only a month and a half away before it stalks onto store shelves. Enough of the shameless self promotional masticating.